Nearly all of the lakes allow electric motor boats and prohibit internal combustion motor boats. However, there are a few select lakes that were designed specifically for waterski boats, but we’ll save that for future discussion. All lake subdivisions have a monthly HOA fee which can range from $40 – $550 per month depending on the size of the lake and the number of homes in the subdivision. If you would like more specifics on any lake or waterfront communities in the Phoenix area, please contact with any questions or requests for information. Chandler is home to many beautiful lake communities including Ocotillo Lakes, Pinelake Estates, Fulton Ranch, Oakwood Hills, Lagos Vistoso, The Springs, Anderson Springs, Balboa Point and Embarcadero. The combination of quality schools, proximity to semi-conductor employers such as Intel, parks, shopping and access to freeways make Chandler a desireable place to call home. Gilbert lake communities include Val Vista Lakes, Lago Estancia Stonebridge Lake Estates and The Islands among others. 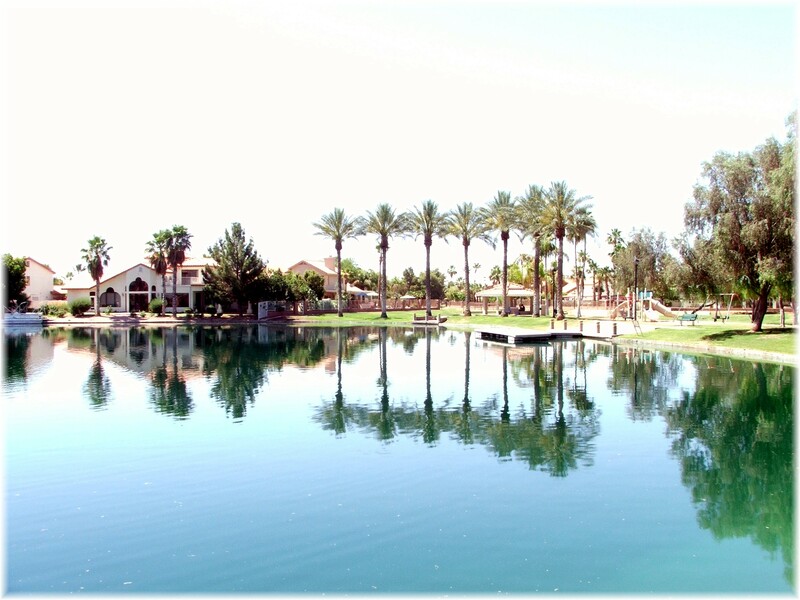 Waterski lakes are Gilbert’s forte which include Playa del Rey, Crystal Point, and Santan Lakeside Estates. Two are tournament slalom course lakes surrounded by waterfront luxury homes. The slalom water ski course lakes measure approximately 2,250 ft. in length. Scottsdale water sport aficionados are proud of Bartlett Lake and its’ 2,815 acres of aquatic enjoyment. Scottsdale waterfront communities include Scottsdale Ranch, McCormick Ranch, Scottsdale Country Club and Gainey Ranch. 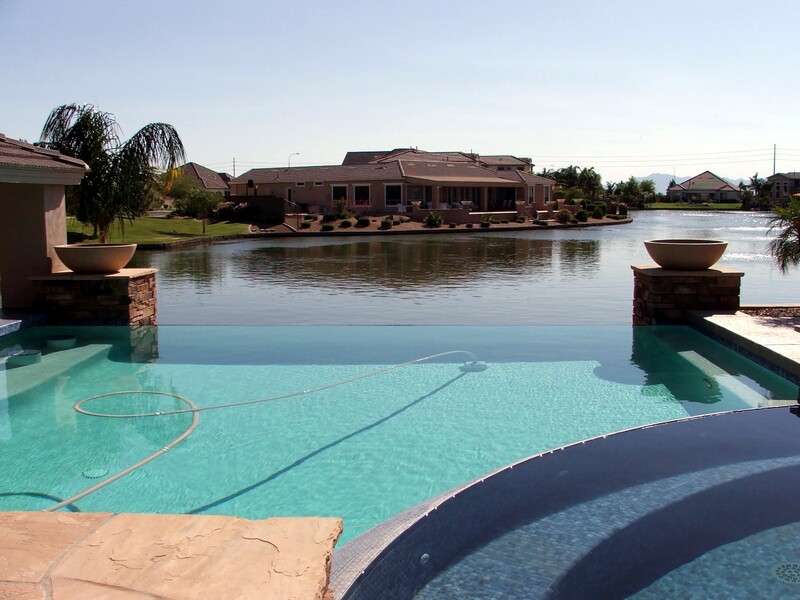 Scottsdale lake communities demonstrate luxury living in one of the valley’s most desireable locations. Some of the most recent lakefront community construction has taken place around Tempe town lake at Onyx Tower, Northshore Condominiums, and Hayden Ferry Lakeside. For those looking for single family lake community living in Tempe, The Lakes is located south of Baseline between McClintock and Rural Rd. The Oasis at Anozira is another single family lake community in Tempe with waterfront views. Mesa’s first planned community is a lake community. Wilson Wesley Dobson emigrated from Canada and purchased the land which later became known as Dobson Ranch. In the late 1800′s, the land was used for cattle ranching and farming. As many as 20,000 heads of cattle roamed what is now known as Baseline Rd. in Mesa. Now residents enjoy the 7 lakes, community pools and tennis courts and other amenities provided in Dobson Ranch. Glendale’s largest and most attractive waterfront and lake community is the Arrowhead Ranch and Arrowhead Lakes area. It is a rare combination of waterfront and mountains unlike any lake community in the valley. It also enjoys the convenient access to the 101 freeway loop which makes any commute that much easier. The lakes are made possible through reclaimed water and are used in landscape irrigation thus saving valuable drinking water. Avondale’s two lake communities are Garden Lakes and Crystal Gardens and are adjacent to each other. Garden Lakes to the north is the older of the two lake communities, built in the late 1980′s. Crystal Gardens homes were built between 1999 – 2002 and are surrounded by the Avondale Wetlands project. Both are conveniently located near the 101 and I-10 freeways and enjoy a short commute to the University of Phoenix stadium and home of the Arizona Cardinals. I just came across your blog and am excited to see there is someone out there that understands waterfront property. I am looking forward to learning more and will follow this blog.